La tumeur mixte du rein est une entité bénigne d'individualisation récente. Nous rapportons le cas d'une patiente ménopausée âgée de 56 ans qui consultait pour des douleurs abdominales. L'échographie concluait à une masse rénale droite kystisée classée Bosniack IV. Une néphro-urétérectomie a été effectuée et l'examen histopathologique concluait à une prolifération tumorale biphasique associant un contingent épithélial et un contingent mésenchymateux. Mixed epithelial and stromal tumour (MEST) of the kidney, is a recently recognized entity;itis a rare and benign neoplasm of unknown etiology. It was first described by Michael and Syrucek in 1998 , and was previously called “cystic hamartoma of the renal pelvis”. About100 MEST cases have been reported in literature. Aim: We herein describeanother case of MEST and discuss clinical and pathological features of this unusual entity. 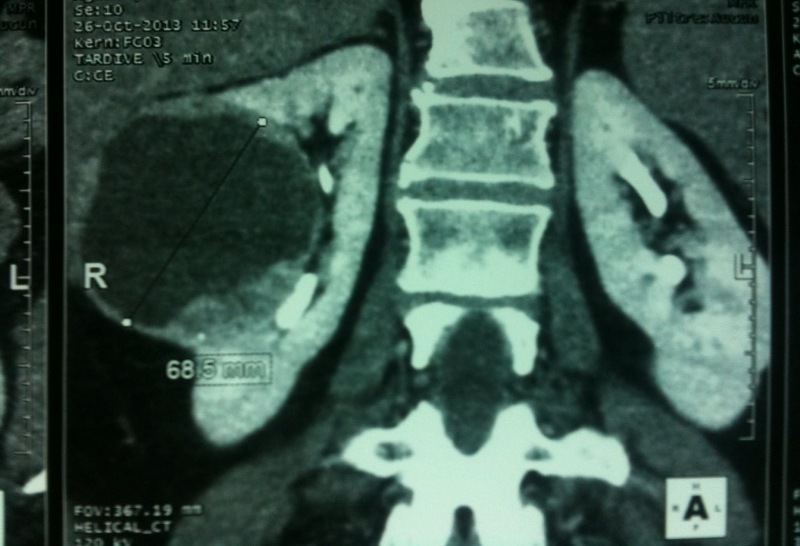 A 56 years old post-menopausal woman presented witha right abdominal pain. She had no relevant medical history and physical examination was unremarkable.Ultrasonography revealed the presence of a right solid and cystic renal mass.Computerized tomographyscan showed a well-circumscribed tumor measuring 68x65mm with cystic and solid components, located in the interpolarregion of the right kidney and which was classified as BosniakIV(Figure 1). A radical nephrectomy was performed. Gross examination showed a well-circumscribed,encapsulated solid and cystictumor of the mid-kidney measuring six centimeter in diameter. Tumor was whitish and firm. The cystic component was mucous-filled. No area of necrosis was found. Microscopically, the tumor was surrounded by athick smooth muscle capsule without invasion of renal tissue. It was biphasic with epithelial and spindle cells components. Epithelial pattern was composed of large cysts, micro-cysts and tubules dispersed or closely aggregated lined by cuboidal and columnar cells (figure 2) with eosinophilic or clear cytoplasm and round regular nuclei. Mesenchymal component was abundant arranged in fascicles of spindle cells with no cytological atypia or mitotic figures. Imunohistochemically, epithelial cells expressed Cytokeratin7, Epithelial MembranAntigen(EMA), vimentin and Cytokeratin19 (Figure 3, 4). They were negative for AMACR, CD15, CD10 and Hormonal Receptor (HR).The spindle cell component was positive forcaldesmon(Figure4).The diagnosis of MEST was retained.Up to now, the patient is free from disease. MESTis a rare benign tumour of the kidney,occurringpredominantly in peri-menopausal women with a mean age of 46 years old.Rare male or pediatric MEST cases have been observed .Clinically, most patients presented with abdominal mass, flank pain, urinary tract infection orhematuria.In25% ofthe cases, the tumorisincidentally detected on imaging during routine investigations for other diseases .Tumor appearson computer tomography scan as a well-circumscribed renal mass with variable proportion of multi-septate cystic and solid components. Radiological findings in MEST are not specific;up to 70% of these tumours are classified as Bosniak type III or IV. They can mimic a variety of cystic renal lesions, including cystic renal cell carcinoma,adult cystic nephroma, congenital mesoblasticnephroma and even angiomyolipoma. Pre-operative diagnosis, as in our case, is difficult and pathologic examination is required to rule out a malignancy and attest the diagnosis. In gross pathologic examination, MEST is a single, centrally locatedand well-circumscribed lesion with a mean size of 6 cm. It is composed of solid and cystic areas;with occasional calcifications.Microscopically, tumor is typically biphasic with mesenchymal and epithelial elements.The mesenchymal component may be loose,hyalinizedwith bundles of collagen or shows myxoid changes, elsewhere; cellularity may be increased especially around cystic areas .It is made ofsmooth muscle or nondescript spindle cells.The epithelial componentis made of cysts and tubules uniformly dispersed or closely aggregated, lined by flattered, cuboidal, columnaror hobnail cells with clear or eosinophilic cytoplasm. Mitotic figures, hemorrhage and necrosis have not been described .Immunohistochemically, the epithelial cells are positive for cytokeratin and EMA. The spindle cells express vimentin, smooth muscle actin, and in some casedesmin. They also show reactivity to estrogen and progesteron receptors, in respectively 62% and 85% of cases, especially in MEST with ovarian-type stroma . MEST is considered to be a benign tumor without recurrence or metastasis, although a local recurrence had been reported once 21years after surgery. However, malignant transformation has been described in rare cases;it may be observed in either epithelial and spindle cells components showing features of synovial sarcoma, rhabdomyosarcoma, chrondrosarcoma and unclassified sarcoma. 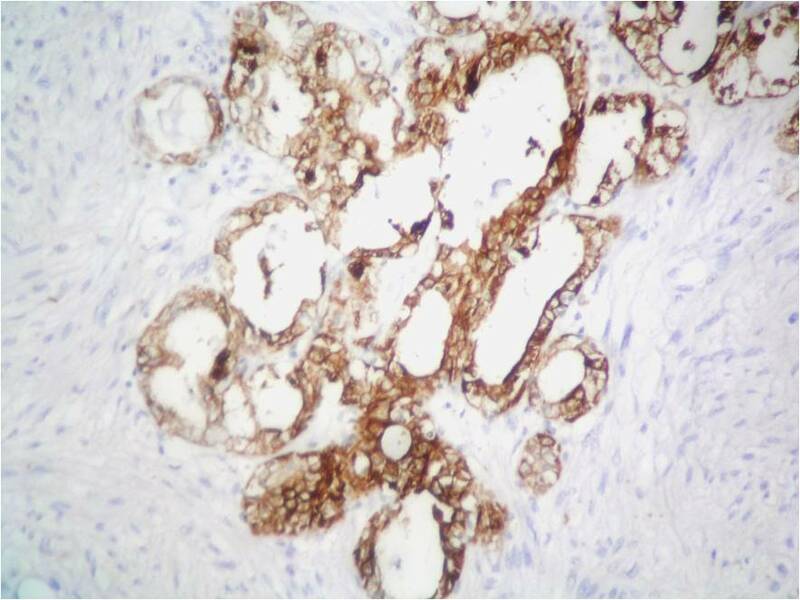 Recently, two cases of malignant MEST with carcinomatous component have been reported .MEST is a rare benign entity that should be suspected on peri-menopausal women presenting with a multicystic renal mass. Better investigations on its radiologic features should help recognizing these tumors before surgery. MEST is a recent recognized rare tumor of the kidney with a good behavior. It should be considered as a possible diagnosis in cases of biphasic renal mass, especially in perimenopausal women or those who have received hormonal therapy. Pathological features may easily distinguish MEST from others cystic renal neoplasms, except adult cystic nephroma which represent the major differential diagnostic. Figure 1: Computed tomography showing a well-circumscribed tumorwith cystic and solid component region of the right kidney Bosniak IV. 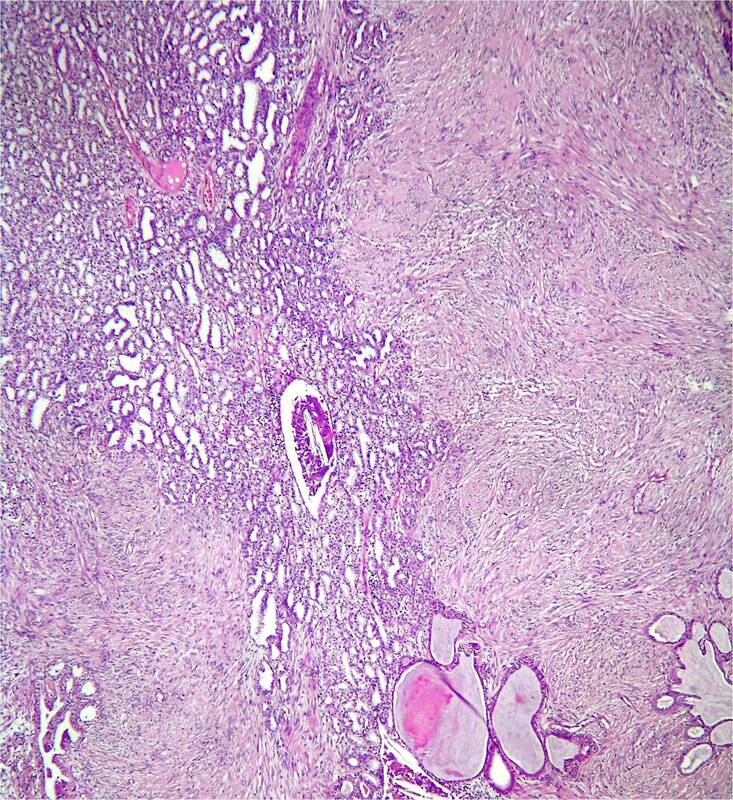 Figure2: Mixed epithelial and stromal tumor. The stromal component is done of fascicles of spindle cells.The epithelial component is characterized by small tubulesdispersed or closely aggregated associated to areas of cystic dilatation. 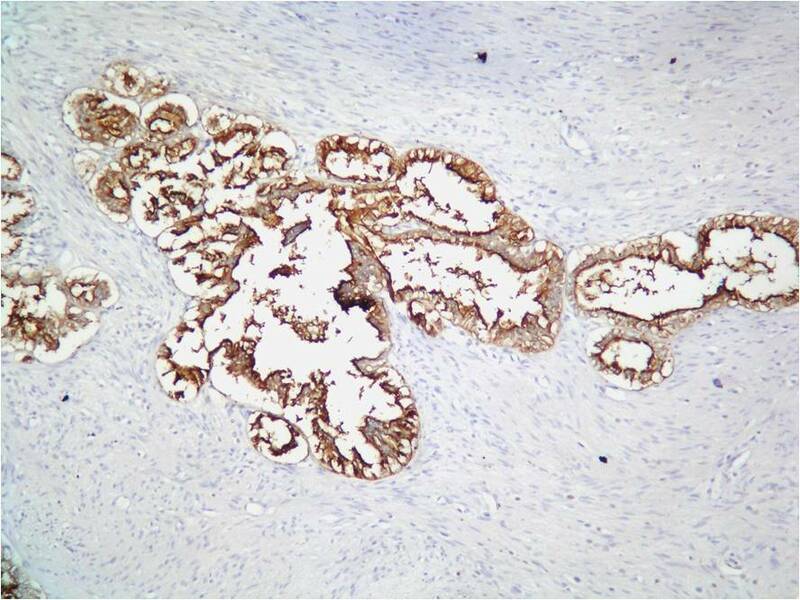 Figure3: Cytokeratin stain on epithelial component. Figure 4: Epithelial membrane antigen stain on the epithelial component. 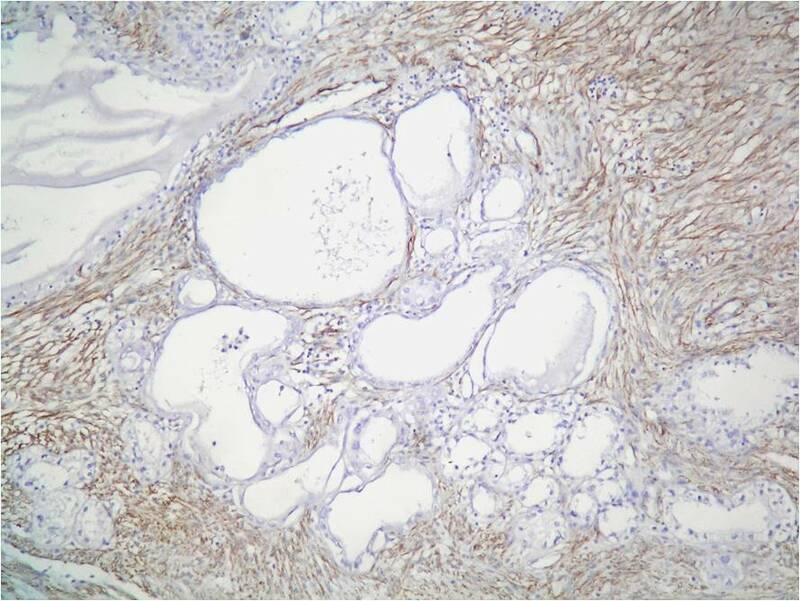 Figure 5:Caldesmon stain on spindle cells of the stromal component. Michal M and Syrucek M. Benign mixed epithelial and stromal tumor of the kidney.Patho Res Pract 1988. 194:445-58. Pierson C R M ,Schober T, and Wallis T et al. Mixed epithelial an stromal tumor of the kidney lacks the genetic alterations of cellular congenital mesoblasticnephroma .Hum Pathol2001.32(5) :513-20. Michal M, Hes O, Bisceglia M et al. Mixed epithelial and stromal tumors of the kidney: a report of 22 cases.Virchows Arch2004.445:359-67. Kum JB, Grignon DJ, Wang M, Zhou M, Montironi R, Shen SS, Zhang S, Lopez-Beltran A, Eble JN, Cheng L. Mixed epithelial and stromal tumor of the kidney: evidence for a single cell of origin with capacity for epithelial and stromal differentiation. Am J SurgPatho, 2011 ;35(8):1114-22.